Full disclosure – I was provided a copy of this book by the author however I have voluntarily chosen to write a review. All opinions are my own. 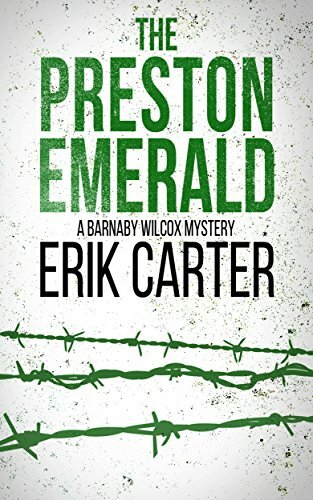 “The Preston Emerald” is the second in the Barnaby Wilcox Wild West series of books by Erik Carter. Set very shortly after the close of “The Clements Kettle”, Barnaby has resumed the not so glamorous life of the P.I. Business is still slow in Desecho, in fact Barn finds himself in the employ of the patriarch of the town’s resident outlaw family. The Beazles are dying off mysteriously and Rocco is convinced that they are being poisoned. Barnaby isn’t so sure, but still it’s a case and one he wants to solve before anyone else dies. When he receives an invitation to spend the evening at the home of an eccentric old man, Barnaby is intrigued, so he accepts and him and Fannie make the long journey out to the estate not knowing what to expect. As the rest of the evening’s shady guests arrive and the weather starts to take a turn for the worse, it becomes apparent to Barnaby that the Beazle case may not be the only crime that he ends up solving. Okay, so first and foremost, I really liked this book! Having recently become acquainted with the citizens of Desecho in “The Clements Kettle” it was nice to catch up with the entire cast of characters in this follow up offering. Barnaby has his hands full in this episode, between poisoned outlaws, disappearing emeralds, dead bodies and a trio of ladies all vying for his attention, it definitely made for an entertaining and easy read. My first thoughts about the evening at the Worthington mansion was that the book was starting to remind me a lot of the old “Clue” movie from the 80’s. While some may find this “formulaic” or “cliché” I quite enjoyed it and even though this is a well-used premise, Carter still managed to make it fresh and interesting. I also enjoyed the glimpse into Mory’s backstory as the town villain and hope to see more of his story if the Wild West Mystery series is to continue. If you like Westerns, Comedies or Cozy Mysteries you will most likely enjoy The Preston Emerald.